When designing a landscape, why not make it edible? Fruit and nut trees, berries, grapes, herbs and veggies are all beautiful and edible – the choices are endless. There are many edible plants that can fill the same niches that other more common plants fill, plus they provide food for us as well as being edible plant materials for native wildlife. 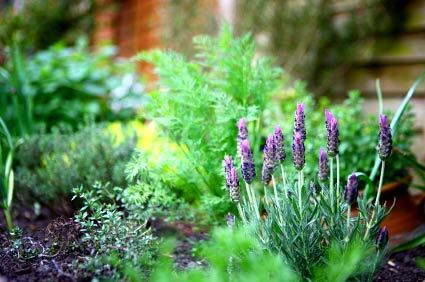 Thyme, lavender, dill and other herbs make great garden fillers or they can be a decorative area in your landscaping on their own. 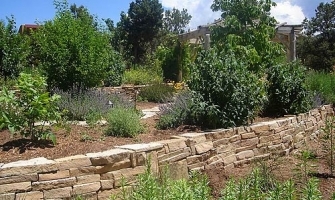 What are the benefits of including edible plants and trees in my landscaping? The benefits are plentiful: Fresher, healthier fruits, vegetables and nuts, reconnecting to the land, knowing where your food comes from, contributing to a more sustainable ecosystem and supporting the wildlife in your area. Plus, if you’re going to water your landscaping, why not use that same irrigation to help provide some of your food as well? 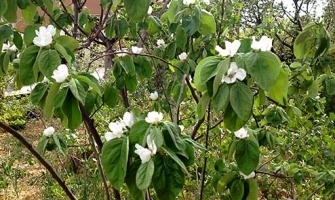 You’ll find some examples of plants and trees that can do double duty as both decorative landscaping and fresh food sources on this page. 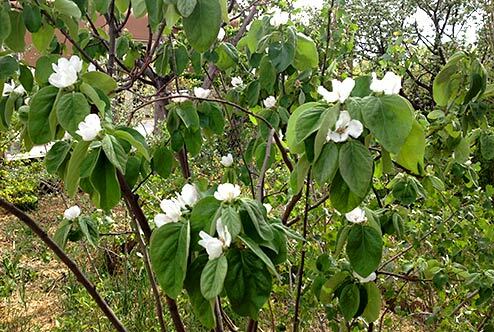 What kinds of plants can an edible garden in New Mexico have? The high desert is a wonderful place to grow food, especially if your water needs are taken care of using rainwater harvesting. Plants typically grown here for both their beauty and nourishment are: many kinds of herbs (for culinary, medicinal and aromatic uses), colorful chards, salad greens, sunflowers, grapes, berries, and of course, fruit and nut trees. 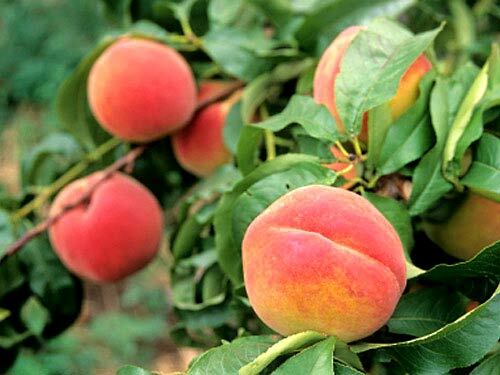 Fruit trees provide landscaping focal points, along with summertime shade and the delicious reward of sweet, fresh-picked fruit. 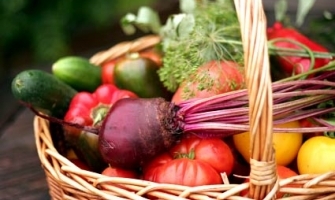 Also part of the mix: tomatoes, chiles, squash, beans, corn, peas, beets, carrots, and anything you can creatively incorporate into your landscaping design! We have a great growing season, from May to September, but more than that, we have consistent sunshine and can create micro-climates that can extend the growing season by months, even the entire year. 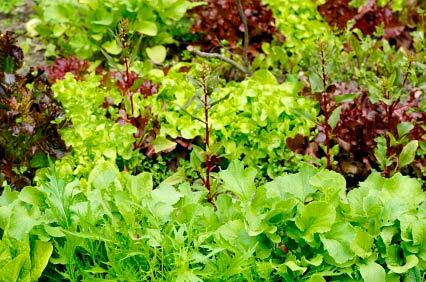 Cold frames can extend the growing season for cool season crops all year long, as well as planting on the south side of a house or wall. Why is it important to consider growing an edible garden? Where our food comes from is becoming more and more critical to our health and well-being. Growing food on your own land is a healthy, economical, therapeutic and very satisfying endeavor. Incorporating edible plants into your landscaping gives you a return on your investment that is both smart and delicious. When we grow our own food – even a tiny percentage of it – we are creating a more sustainable world. Large scale food production in America has unfortunately become a money-driven business instead of a health-driven business. Non-renewable resources are being used to transport food thousands of miles while losing quality, nutrients and freshness in the process. Interspersing edibles with other perennials gives you the best of both worlds. 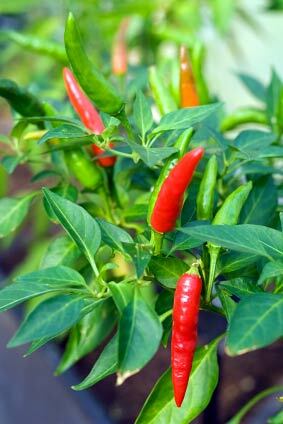 Here, a chile plant provides color, flavor and spice to your meals. Can gardens be perennial or seasonally producing, or both? 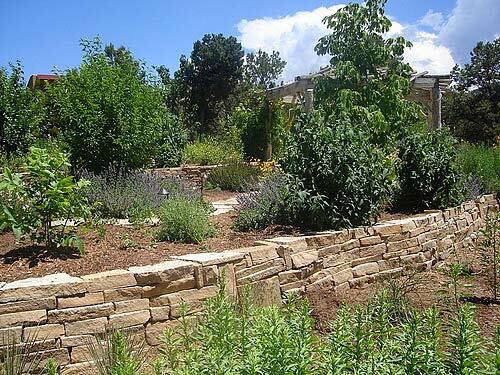 Gardens set up in the thoughtful approach that permaculture design teaches, are both perennial and annual. 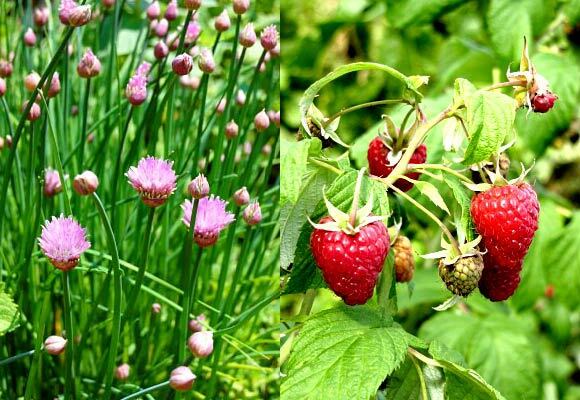 There is no reason a combination garden can’t be planted under a fruit tree with perennials like currants, strawberries, rasberries, artichoke, asparagus, comfrey, etc. alongside a blend of your favorite annuals, like carrots and beets and a squash or two. How much maintenance does an edible garden require? 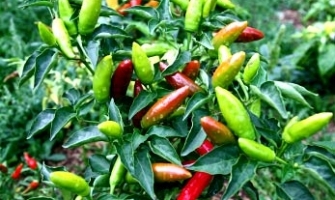 The main ongoing maintenance required in an edible garden – once it is established – is to water, weed, harvest and eat! Otherwise, the labor intensive part is the one-time set-up of the garden area and then preparing seeds and seedlings for planting. Is edible landscaping feasible in apartments and urban environments? With permaculture, a garden can be anywhere. A south facing window in an apartment, a small raised bed on a balcony or roof, or a community garden with your neighbors. The only limitation is your imagination and resourcefulness! Experimentation and a little research will lead to answers. 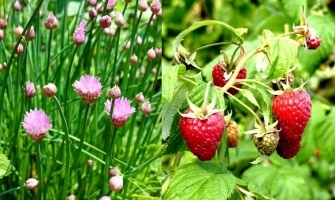 Flowering chives & berries, beautiful and delicious! 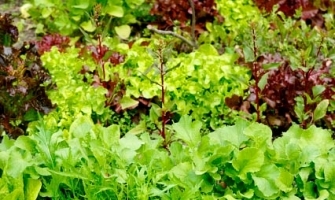 Plant lettuces in shady areas among flowers. Delicate flowers of a quince fruit tree. Plum, horsechestnut and quince trees. Raised beds can provide a myriad of veggies. 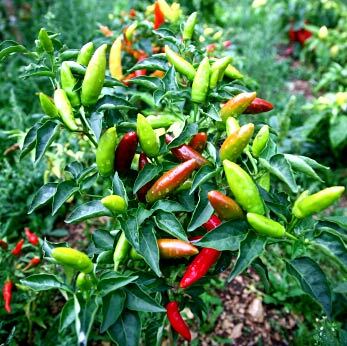 Chile peppers add colorful, edible accents.